After the Spring Grand Service on January 26, the dismantling of Church Headquarters’ South Gate was initiated. Its removal is expected to be completed by June 26. Until then, the area around the gate is blocked off. The South Gate was built in January 1936, the month when the 50th Anniversary of Oyasama was to be observed. 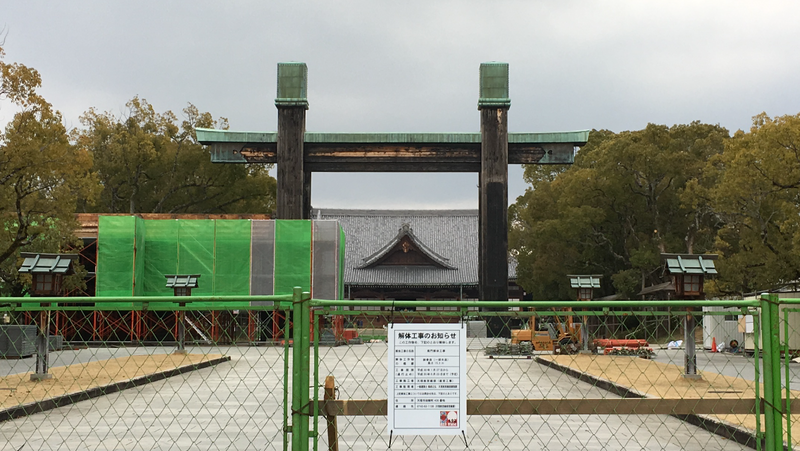 Following the completion of the South Worship Hall during the Showa Construction, the gate was set up as part of efforts to improve the approach to the sanctuary. The gate was about 15 meters (49 ft.) in height and 10 meters (33 ft.) in width. On its front side, there was a big, wooden sign that read “Tenrikyo Church Headquarters” in Japanese, and the purple Tenrikyo flags flew from the gate on the days of the Monthly and Grand Services. It has been 82 years since the gate was built and, due to the significant deterioration of its wooden and metal parts, the decision was made to dismantle it. During the dismantling period, it is advised that pedestrians take either the east or west overpass to go between the Main Sanctuary and the South Wings of the Oyasato-yakata building-complex.